The spunky Miniature Schnauzer is not just friendly and energetic, but also makes a good guard dog and mouser. The Miniature Schnauzer is a member of the Terrier group with its origins dating back to nineteenth century Germany. It was established by crossing the Standard Schnauzer with one or more small breeds, such as the Affenpinscher or Poodle. This energetic companion was bred to be a farm dog, it excels at catching vermin. Miniature Schnauzers are one of the most popular dog breeds in the United States. Mini Schnauzers are playful and happy dogs. They are very affectionate, smart, and they aim to please their owners. It is a great dog for children. This breed travels well and makes a great watch dog. Unlike some small breeds, the Mini Schnauzer does not bark excessively. When selecting a Miniature Schnauzer as a pet, be aware that they are somewhat prone to diabetes, von Willebrand's disease, kidney stones, and liver problems. They are prone to hereditary eye problems so ask your breeder if there is any history of eye problems in his dog's lineage. Skin disorders are also fairly common in this breed, but most Mini Schnauzers, are quite healthy. Breed Type The Miniature Schnauzer is a type of Terrier. Known for being friendly, spunky, and energetic, the Miniature Schnauzer makes a good guard dog and mouser. Background The Miniature Schnauzer was bred down from the Standard Schnauzer. (There is also a Giant Schnauzer, which was produced by breeding the Standard Schnauzer with larger breeds.) Breeds crossed with the Standard include the Affenpinscher and the Poodle. 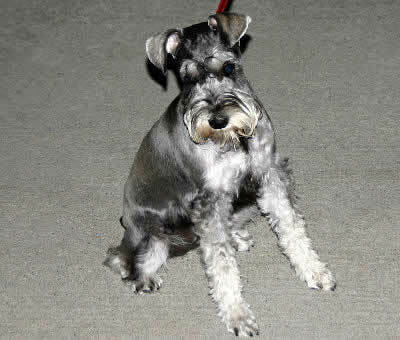 The first known Miniature Schnauzer was recorded in 1888. Mini Schnauzers were first employed as farm dogs, often guarding the herds and families. Eventually farmers recognized their innate talent for hunting rats, and they began keeping them exclusively for this purpose. Today, the Miniature Schnauzer is primarily a companion dog. The breed was accepted for registration by the AKC in 1926. Description The Miniature Schnauzer has a sqarish stature and a long head with a bushy beard, mustache and eyebrows. Its eyes are oval and dark in color, and its ears are v-shaped and folded unless cropped to a point. The muzzle is prominent with a black nose. Tails are usually docked where permitted. The breed's most distinctive features are its beard, mustache and bushy eyebrows. Colors of the wiry coat include salt and pepper, black, white, and black and silver. Miniature Schnauzers are 12 to 14 inches tall and weigh 10 to 15 pounds. Care and Feeding The best foods for a Mini Schnauzer include pork, beef, potato, wheat and beets. They are prone to weight gain if they do not receive a proper diet. Sweet and fatty foods should be avoided. Regular brushing or combing is essential to keep a Miniature Schnauzer's coat free of matting. Clipping should be done twice a year and is best done by a professional groomer. Show dogs should be trimmed and hand stripped. The whiskers should be cleaned after each meal to avoid staining. Tails can be docked or left natural. Miniature Schnauzers' tails are to be docked according to AKC standards, and the ears may or may not be cropped. Both of these procedures are done when the puppy is just a few days old. Miniature Schnauzers shed very little, so they make good dogs for allergy sufferers and are easy to clean up after. Housing Your Dog Miniature Schnauzers do well in apartments and other small living spaces. They are somewhat active indoors, and they do not require a yard. Social Behaviors In general, Miniature Schnauzers are amicable with everyone, including children. But socialization is very important in order to ensure that they are not skittish around strangers. They do like to chase smaller animals such as hamsters and birds. They can sometimes be aggressive toward other dogs, but socialization can minimize this tendency as well. Handling and Training Schnauzers are quite intelligent, and they can be trained easily with positive reinforcement. They are not tolerant of being reprimanded. Breeding/Reproduction The Miniature Schnauzer is prone to several types of genetic defects, eye problems are a primary concern in breeding stock. When selecting a mate to breed your schnauzer with, it is important to make sure the dog has been checked for these types of problems or request an eye exam. Coloring should also be carefully considered, as nonstandard coloring is fairly common. Common Health Problems Common health problems of Miniature Schnauzers include kidney stones, von Willebrand's disease, diabetes, and liver problems. The incidence of most of these problems can be reduced by making sure your Mini Schnauzer gets a proper diet and doesn't become overweight. Feeding your dog foods that are low in fat and unsweetened will go a long way toward preventing these ailments. It is also important to check the ears regularly, as this breed is prone to ear infections. Availability Due to the breed's immense popularity, Miniature Schnauzers are readily available in most areas. Prices are usually around $500. I love my mini Schnauzer, Sgt. Schultz. We go outside as weather permits, but he loves to play indoors too. Luckily we have a long hall way. Our mini loves to fetch and is pretty good about bringing back his toys, for you to "do it again" and again... I would agree they do well indoors, but really need to release that energy. Ours is a "chewer", so best to pick up shoes!